Nearly two-thirds (63%) of businesses that publish a blog say first-time visitors account for more than 80% of the traffic to their blogs, according to a survey from Compendium. 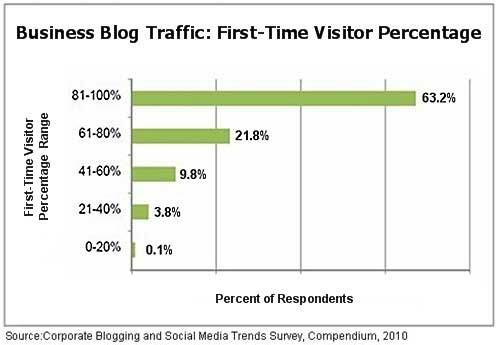 Although most business blogs tend to have a small, core group of loyal readers, the study reveals just how small those groups are, relatively speaking; the overwhelming majority of traffic to most business blogs consists of first-time visitors. Below, other findings from The Corporate Blogging and Social Media Trends Survey, which polled 266 companies about blogging traffic, visitor trends, and Twitter use.